If you really love someone, say so! 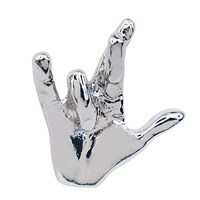 This shiny gold-plated pin proclaims, "I really love you" in sign language. The clutch-style safety backing reduces the chance of losing it and eliminates the risk of accidental pricking. Hand is realistically detailed. Pin will make a gorgeous statement on any outfit. Measures approx. 1.00 in. high.